For some of us the decision to run the trail goes back further than this, but for Ed the decision was made on the 4th. The evening started so innocently with Ed driving us to the Dinas Bran fell race, but during a discussion about the impending end to end trail attempt resulted in a slip of the tongue from Ed stating that he’d like to do it one day. Well, no time like the present, so by the time we got to the race we were telling everybody else that he was running it with us. By the time we were driving home the post race buzz has left Ed agreeing to run it with us. Result! Not content with the planned 33/34 mile run from Whitchurch to Frodsham, I decided that a run to the meeting point was in order… ok, I was late to the rendezvous, but good spirits were maintained. Ed, Steve Riley and myself were all set and Adair had a car packed with our food, his magazines, music and a tub of Vaseline – the mind boggles! We picked up Andy Robinson and headed out to the start, checking a few final elements in advance of the challenge event on Saturday. The toilets were indeed open and the route to the start simple to follow so all was set. A brief photo call for the intrepid four followed by a minor delay to find satellite signal for my watch and we were off. The weather was reasonable good for running, no sun to speak off, but it was easily warm enough for shorts and a t-shirt (although Ed did provide us with a strip tease along the way and a number of outfit combinations), rain threatened, but never really got in the way, but the wind did provide a degree of challenge in places. The opening three miles are thoroughly pleasant and easy to navigate (although I managed to go wrong within 300 yards of the start), but it is deceptive as it is easy to get drawn into going out too quickly down the tow paths… which I did banging out sub 7 minute miles not really in the plan, but they felt slow. Even at this early stage any thoughts of running together have gone out of the window and our competitive edges have come out. Within a few hundred metres of leaving the path I made my first “inefficient route choice”, back on track I cracked on to the first check point. Adair had agreed to crew for us so with five check points to man he had his work cut out – often supporting can be more difficult than running it; but we’ll get into that later. Shoe issues fixed and muffin on board I made my next interesting navigational choice and which trying to correct it I spotted Ed behind me. Back on track I waited for Ed to run together and Andy appeared with Steve not far behind so we’d bunched well. I pushed on only to take my most impressive inefficient route choice just past Michael Owen’s race course, but Ed did too so a quick check of the map and a few minutes lost we cracked on. Adair met us with our food and water and I made the mistake of downing a full sports drink which was to play on my stomach for a good few miles. I managed to leave as Andy came in and cracked on for what turned out to be a bit of a long haul! It turned out I wasn’t the only one to experience navigational difficulties. I’d built up a head of steam and came into Beeston expecting to see Adair. Nothing. I figured he must be a bit further on due to the parking charges at Beeston, but every possible point I found there was no sight of him. I was really struggling with stomach cramps and didn’t fancy taking anything else on. By the hill just before rock farm I was starting to bonk and seemingly out of nowhere Ed and Andy appeared behind me. Even the stunning view over the Cheshire plains didn’t help as I pushed on. It was not long before experience trumped youth and Andy took the lead. 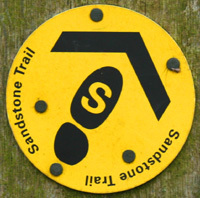 For those that know the trail it was on the climb over the sandstone which you wonder whether to run it or not. I was walking! A ridiculously apologetic Adair greeted us at Gresty’s waste. I was just behind Andy, but he was off quickly whereas I spent just over 8 minutes refuelling during which time Ed came in. Throughout the entire 8 minutes Adair made excuses for not being at check point 3 or 4… he laid it on so thick and we were so exhausted that we even started to feel sorry for him! For me, the highlight of the run came just as I was about to leave Delemere forest near Manley common. A lone figure appeared with a dog which as I got closer turned out to be Mario, “you’re going well lad, do you want some water? I’ve got a Milky way in my bag if you want it!” A superb boost just as I was really starting to feel human again. He also informed me that Andy had put almost 8 minutes on me since Gresty’s which put him out of sight. I now had a new goal; maintaining sub 10 minute miles to beat my previous best of 5:29:30. I had my work cut out. I pushed hard, played all the mind games with myself that I could. The Baker’s dozen was cruel and I didn’t have the time to enjoy the fantastically clear views from the war memorial. A hard final push lead me to arrive at the finish in 5:26:42 just over two minutes behind Andy who made it in 5:24:31. Both my arms were tingling as if I they were about to go into pins and needles. Andy came to the rescue with some magic Kendal mint cake which had me right within a couple of minutes. It seemed refusing the kind offer of a milky way would have been a mistake if it had been any further! A well deserved pint was ordered for the pair of us whilst we waited for Ed and Steve to arrive. Ed came in next with a superb time of 5:42:55 and Helsby uber supporter Joe arrived just in time to cheer Steve in with an excellent 6:06:50 much to the extreme delight and hero worship of his wife and daughters. A truly fitting end to an excellent morning run!